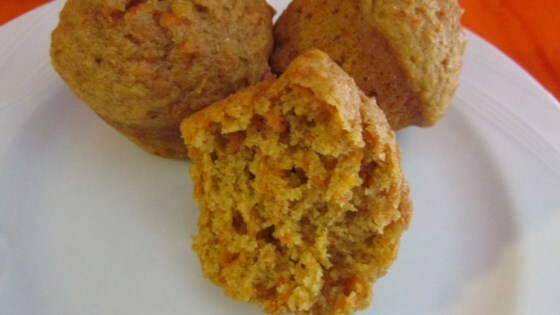 "These muffins are packed with whole wheat, carrots, and orange zest. Very little guilt and lots of flavour; YUM!" Sift whole wheat flour, all-purpose flour, baking powder, baking soda, and cinnamon together in a bowl. Whisk eggs, brown sugar, applesauce, and vegetable oil together in a bowl. Stir egg mixture into flour mixture just until ingredients are moistened; fold in carrots and orange zest. Spoon batter into prepared muffin cups. Bake in the preheated oven until a toothpick inserted near the center comes out clean, about 30 minutes. very yummy and moist. and the part I like the most is that they are not too sweet. will make these again. thanks for the recipe! blan, have to serve with butter or cream cheese.